What do you think of the Google Pixelbook and the Pixelbook Pen? Google made a slew of announcements today including the $999USD Google Pixelbook and $99USD Google Pixelbook Pen. The Pixelbook is Google’s shot at the Microsoft SurfaceBook and maybe to a lesser extent, the Apple iPad Pro’s. One of the biggest selling points of the new Google Pixelbook is the Pen and how well the Pixelbook and Pen work together. MyScript has announced they’ve partnered with Google to bring the Interactive Ink technology to the Pixelbook and Pen. 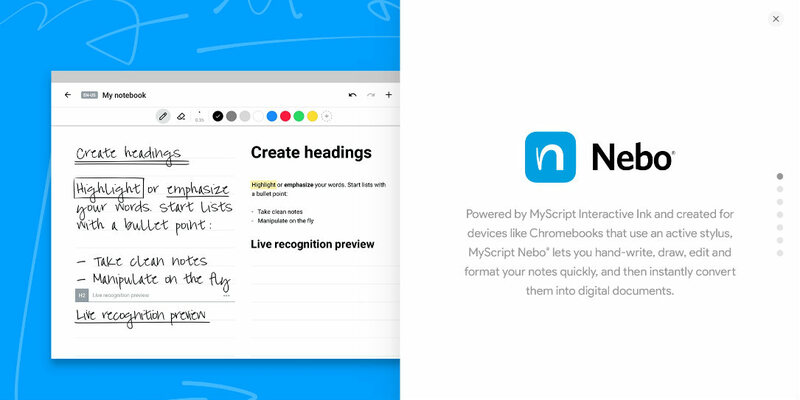 MyScript works in the area of high-performance handwriting recognition and interactive digital ink technology and worked with Google to optimize their Nebo app. The app is available on the Google Play store and MyScript says that Nebo is the first award-winning application of its kind that combines the benefits of handwriting with the power, speed, and efficiency of digital computing. Nebo is available on Google Play for Pixelbook and other Chrome OS devices with active pen support. What do you think of the Google Pixelbook and the Pixelbook Pen? Let us know what you think in the comments below, or on Google+, Twitter, or Facebook.